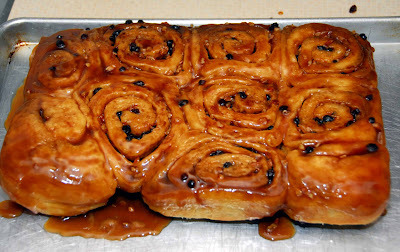 Here is the recipe for the Christmas Day caramel pecan rolls. My wife got the recipe from The Gourmet Cookbook. Stir together all ingredients except the butter. Butter your pan OR large muffin cups (Texas-sized.) Combine butter, sugars, corn syrup and heavy cream in a heavy saucepan and heat over low heat, stirring, until the butter is melted. Bring to a simmer and simmer, stirring, for 2 minutes. Pour into prepared pan or spoon a few tablespoons into each muffin cup. Turn dough out onto a well floured surface and dust with flour. * I used a baker’s couche and covered the rolling pin with a pastry sleeve because the dough is extremely sticky. Roll out into a 16-12” rectangle so that the long side is nearest to you. Brush off excess flour and spread softened butter over all. Sprinkle filling evenly over the dough. Roll up the dough to form a 16”log and press seam to seal. Cut into 12 rounds with a very sharp bread knife or dental floss. Arrange buns, cut sides up, in pan or muffin cups. Cover with oiled plastic wrap and let rise in a warm, draft-free place until doubled (bout an hour.) * I did all of this the night before and retarded the dough’s rise by placing the pan in the refrigerator overnight. This worked well. 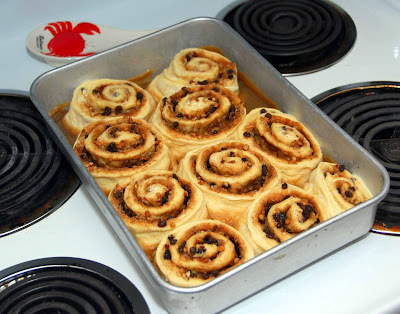 The buns were doubled in size by morning and ready to bake. Place oven rack in center and preheat to 350˚. Bake until puffed and golden, about 30-35 minutes. Cool for about 10 minutes on a wire rack, then invert and remove from pan so caramel syrup is on the top. Serve warm.